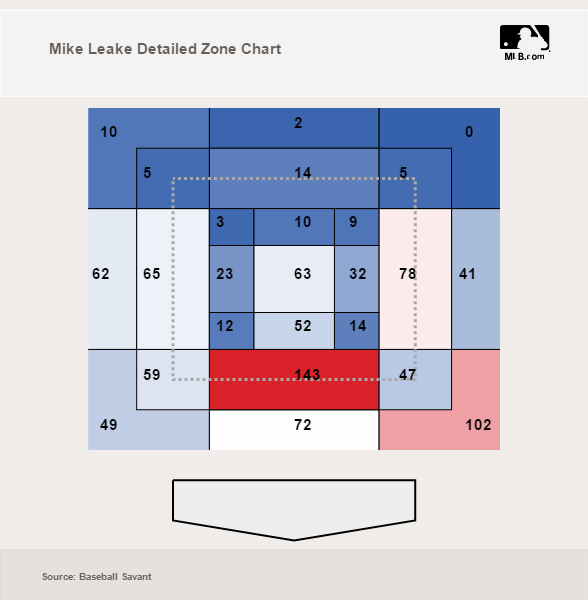 WikiLeakes: What Went Wrong for Mike Leake? To begin the 2017 season, Mike Leake was one of the most cautiously optimistic targets for a breakout season. His low velocity and K-rate had a lot of people worried about how sustainable the success was. But, for a while, he led the league with a 2.03 ERA (5/23). He ended April with 33.1 IP and 5 ER total, good for a 1.35 ERA. While his success came in the face of Jason Vargas stealing all of the low-velocity, soft contact-inducing, ERA-leading thunder, he generated plenty of buzz as a welcome surprise in the Cardinals rotation after a shaky April and beginning of May by resident pitching-staff wizard, Carlos Martinez. Part of this was certainly soft contact combined with luck to create a stellar (but unsustainable) LOB% of 86.5% of baserunners (warning: that article contains an extended metaphor comparing him to “leek soup”). But even in the midst of a brilliant start of the season, many analysts warned about the impending reversion to normalcy, referring to previous stunts of brilliance at the beginning of the season. Since the beginning of June, he has surrendered 7 ER in 11 IP, for a 5.40 ERA. While this is not a disaster when compared to other pitchers who have flamed out (cough, cough, Kevin Gausman), for those who were hoping this was a turn of the page in the story of a 29-year-old soft thrower with roughly a 4.00 career ERA — what happened? Speeding Up or Slowing Down? The most noticeable change is the slight uptick in sinkers for the 92-93 mph and 89-90 mph range, with less of the 90-92 mph variety. For most pitchers, this would correspond to an increase in swings and misses, but for Leake, a pitcher who relies on command and finesse, this has a minimal impact on overall performance. Also, it should be noted that at a certain point, an increase in velocity has higher returns (e.g. a jump from 92 to 95 mph as exhibited by Brewers breakout-ace Jimmy Nelson), but as MLB hitters are used to seeing slightly faster sinkers than Leake’s with less movement, this increase in velocity has small (perhaps even negative) returns on his performance. When I looked at the chart for contact rates broken down by velocity quantile, this phenomena was ever present, although not as prominent for his sinker, but his cutter. The cutter quantiles were based on splitting the distribution into thirds and were defined as follows: “Slow” (v < 89 mph), “Medium” (89 mph < v < 90 mph), & “Fast” (v > 90 mph). 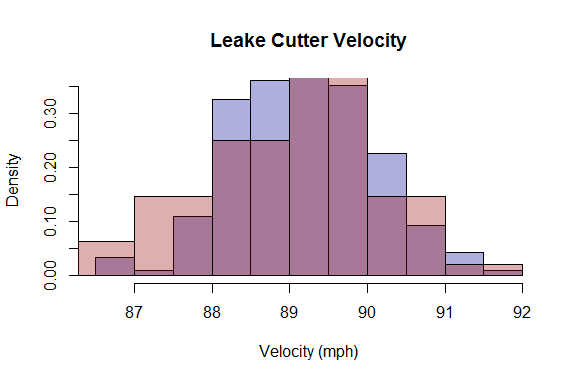 As shown in the above table, the way to miss bats with this cutter is to keep it below 90 mph, and Leake seems to be moving in the opposite direction. The histogram below charts changes in cutter velocity, red being the distribution in June. While he decreased the amount of cutters directly at 90 mph, the number close to 91-92 mph (danger zone) increased, along with the low-velocity 87-88 mph cutter. Also, we can’t rule out the possibility of an injury with a much wider variation in velocity (although there are more reliable metrics for judging injury risk, like variation in spin rate). With the changeup, we see the same story. The changeup quantiles were: “Slow” (v < 85 mph), “Medium” (85 mph < v < 86.5 mph), & “Fast” (v > 86.5 mph). Again, the way he misses bats with this is to keep the velocity under 85 mph. This histogram below categorizing the change in changeups shows that this may be the culprit. Many more changeups are being thrown in the 87-88 mph range, which is really dangerous for a pitcher like Leake whose fastball does not get much faster. A major goal of throwing changeups, especially early in the count, is to disrupt the hitter’s timing. Little research has been done on the optimal separation in fastball and changeup velocity, but generally a 3-4 mph difference is insufficient. It is worth noting, however, that the Statcast pitch tracker system is far from perfect and some of these could very well be slow cutters. Here are some pretty telling gifs (from the same game) demonstrating the two types of changeups. The first is a particularly nasty changeup on the outside corner to strike out Yasmani Grandal. He is not only totally off balance, but uses none of his legs and pokes, trying to stay alive. 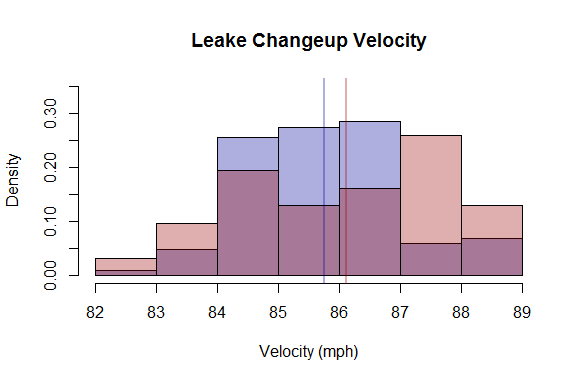 This change in velocity is exactly what we should be looking for when getting the feel for changeups. Now, here’s the high-velocity, flat changeup that has been getting him into trouble. It lacks vertical movement and just sort of slides through the top of the zone. Utley has zero problem keeping his weight back and engaging his hips to launch it over the right-center field fence, which leads me to my next point. Most of the count distributions are roughly the same, but he’s pitching in a lot more 3-1 and 3-2 counts. Leake has never been one to walk many hitters, which may explain the increased exit-velocity numbers. When Leake falls behind in the count (and loses command of his off-speed pitches) he often times has no choice but to spin a cutter over the middle of the plate. 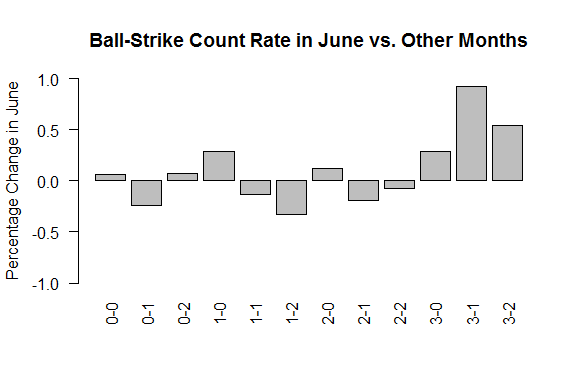 Previous to this last start (6/14) Leake pitched in significantly fewer 3-0 counts, while the amount of 2-0 counts he was in stayed pretty much constant. This could be a sign that he lost confidence to shoot for the corner on 2-0 and would be more likely to catch the middle of the plate. The alternative of a 3-0 count (or subsequent walk) might be the lesser of two evils. Also, the deeper into the count hitters get against Leake, the more comfortable they are against his variety of offerings. Leake thrives off of keeping hitters off balance and surprising them with variations in movement. The more time hitters have to track these pitches, the less effective they will be at throwing off their timing. 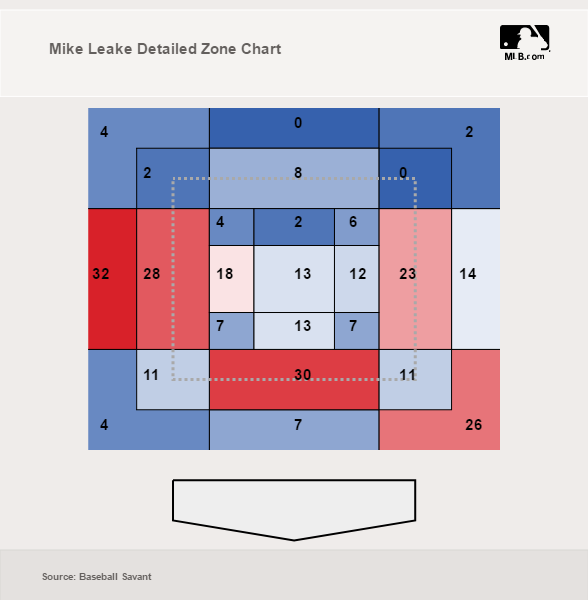 Establishing the inside fastball is a great tool for pitchers with high velocity, but with Leake’s pitch mix, it can be dangerous to leave a sinker middle-in if right-handed hitters have the ability to catch their hands up. Overall, I would caution against reading into Leake’s start of the season as an indication of a fundamental change in stuff. Part of it was most certainly batted-ball luck. Even guys who pride themselves as being soft-contact-inducing studs generally cannot sustain a 0.234 BABIP. Whatever adjustments he made at the beginning of the year have faded. However, look for an adjustment in the coming months to move back toward the bottom half of the zone, especially when behind in the count. I would not be deterred by a slight uptick in BB/9 rate if I saw it accompanied by a decrease in exit velocity. 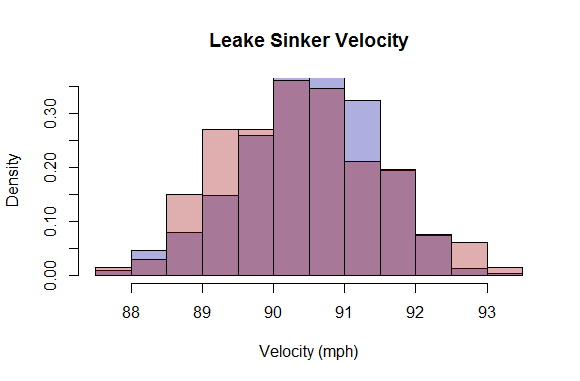 If he can find the sweet spot between leveling out the velocity in his pitches a little more to keep hitters off balance and allow for the most movement possible, we could see another go-around of Peak-Leake. We hoped you liked reading WikiLeakes: What Went Wrong for Mike Leake? by Saul Forman! How did you add pictures to your article?